When you are writing you are actually preparing for the big jump. The big jump is the deep and meaningful work that helps you make progress in your business goals and your personal growth. Writing itself can be deep and meaningful, no doubt about that. In the context of doing it early on your day, it has a more preparational nature. Imagine you are standing on a springboard because you are about to jump 10 meters down into the pool. The stairs up to the board, the steps to its edge where your feet are touching nothing but the air (maybe some tiny jumps on the spot when you are eager) and your last jump into the air before your whole body will be covered by water. 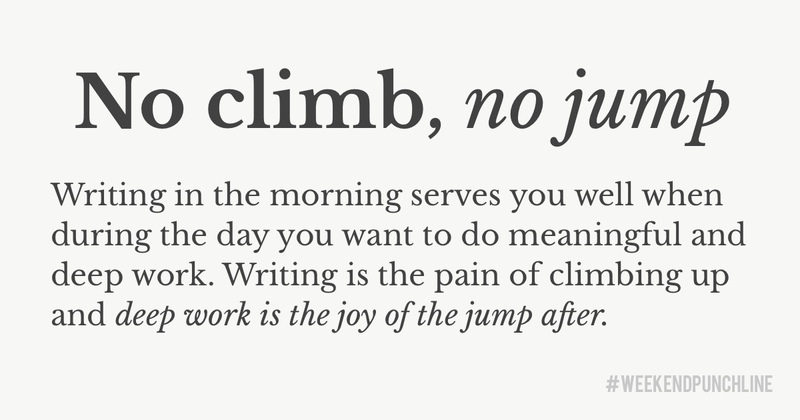 All this preparation before the jump is what writing is in your home-office, but with your feet on the fuzzy floor instead of on a wet springboard. It all starts with climbing up the ladder (or the stairs) up to the board and it is the real physically demanding part — just as starting to write can be demanding. You can have writer’s block, „blank page syndrome“ or anything else that prevents you from actually writing things. Tools like „ilys“ help you with that. Once you warmed up your leg muscles because you made it up to the board you can start walking on the springboard towards the edge. That is when it gets exciting because you know the big work (the big hurdle) is yet to come. Translated to writing it means that in this phase you warmed up your fingers, some possible stiffness has gone and you can now use them to their full potential. You can actually write with ease now and tackle the thoughts in your head that you „bred pregnantly“ so they are ready to be born (= be typed on your keyboard). This is the fun part because you release, release, release until you are super light in the head. Translated back to the jumping board it is the body that you relax before the big jump. In fact, it is a mixture of relaxing (calming down) and sharpening to be fully focussed in a few seconds. Your concentration level on the board is top notch and at its peak, so is your writing flow. You now make your way to the edge of the springboard (with or without pre-jumping does not matter). You breathe in, you breathe out and you jump! In terms of writing, it means that you wrote the last words of your morning writing session and are about to leave your writing environment because you are having a clear idea of what you will do next. So, you hit escape and you jump directly into the environment where you let your deep work happen. Doing deep work requires your full attention and intention just like when you left the springboard, have those seconds in the air, do the flip, rotate spectacularly and dive into the water. Boum! Done. Your deep work session is over because you hit the water, dove inside and came up to the surface again to take some deep breathes releasing your tension and expressing your gratitude for what just happened. If the concept of Deep Work is alien to you, read Cal Newport. This was episode 37 of the #weekendpunchline . Every Saturday and Sunday.